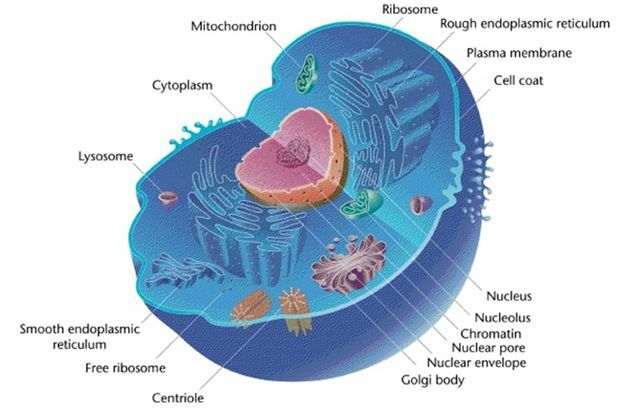 When you think of the typical picture of the eukaryotic cell in a textbook you may imagine the cell as a big balloon full of liquid and organelles. While this simplified view makes describing the organelles easier, it is missing a major component. If the cell was really like this blob cartoon, what would keep the cell from just deflating, how would organelles stay in their correct location, and how would molecules be moved in and out of the cell? 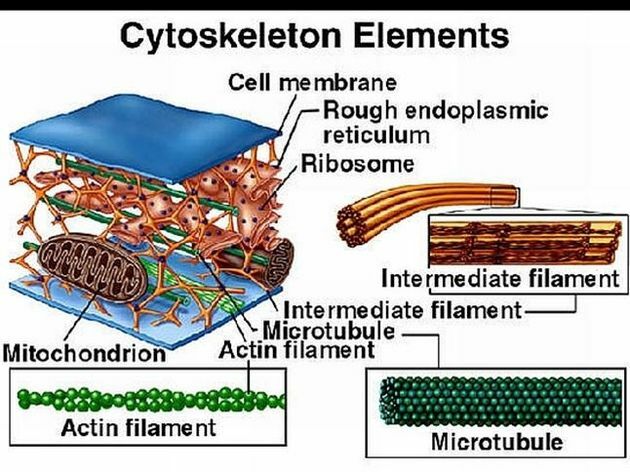 This is where the cytoskeleton comes in. Without proper functioning of the cytoskeleton, diseases including Duchenne muscular dystrophy, Alzheimer's, heart disease, cancer, and skin disorders are prevalent. Microfilaments are the thinnest of the three cytoskeletal fibers. Microfilaments are also known as actin fibers because they are made up of units called actin. Actin is the monomer (smaller piece or subunit) of the larger microfilament (polymer). Actin is involved cell processes that involve movement; it helps the motor protein myosin perform its function in muscle, helps separate cells during mitosis, and provides a scaffold for cargo within the cell to move in and out. Actin fibers are present in the cytoplasm to help move cargo, and also provide shape and structure to the cell. Actin fibers are continually being assembled and disassembled, which helps the cell to move and change. The process of assembly/disassembly can be separated into three phases; nucleation, elongation, and steady-state (treadmilling). During nucleation, the filament is just beginning to form. 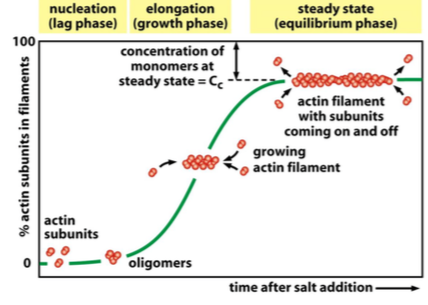 In the elongation phase, actin is being added to the fiber so it grows in length. During the steady-state, treadmilling phase, you can imagine this as building railroad tracks. While one end it being built, the other end is being taken apart, making the fiber maintain the same length. This dynamic process allows the cell to build and take apart fibers and change the properties of the scaffold. Intermediate filaments, as the name suggests, are a size in between microfilaments and microtubules. Intermediate filaments are made up of a fibrous subunit that is wound or coiled together. Examples include keratin found in hair and skin. 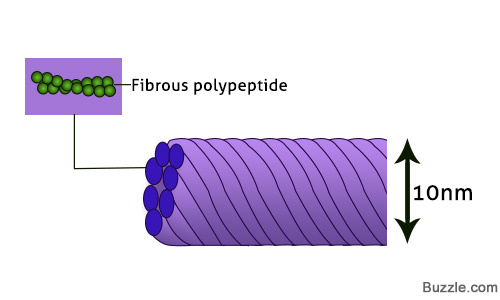 Intermediate filaments are more stiff and permanent that microtubules, and serve as structural support. They do not undergo the dynamic assembly/disassembly seen in microfilaments. Intermediate filaments anchor the organelles and nucleus in place. Microtubules are the largest of the three cytoskeletal fibers. 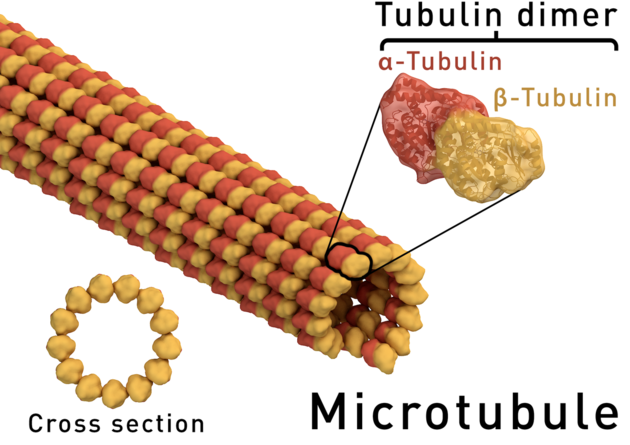 They are made up of subunits called tubulin (alpha and beta tubulin) that are arranged to form a tube-like structure, similar to a drinking straw. Microtubules are similar to microfilaments in that they are dynamically growing and being taken apart, and grow in one direction (like the railroad tracks example). One end of the microtubule can have new pieces added, and the other can only have them taken apart. Microtubules also provide a structural role, as well as some special roles. Microtubules make up the spindle during mitosis that is involved in pulling the chromosomes apart, they transport vesicles around the cell with proteins called kinesins and dyneins, and make up the cilia and flagella. A flagella is a long hair-like structure that helps the cell move; picture the tail on a sperm cell. Cilia are a smaller version of flagella that are present all around the outside of the cell that helps the cell move. 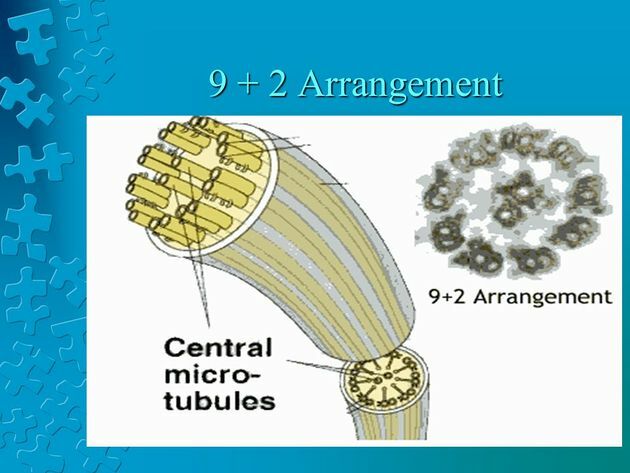 Flagella and cilia both have a characteristic arrangement of microtubules called the 9+2 arrangement. 9 pairs of microtubules are arranged in a circle, with 2 more microtubules in the middle. 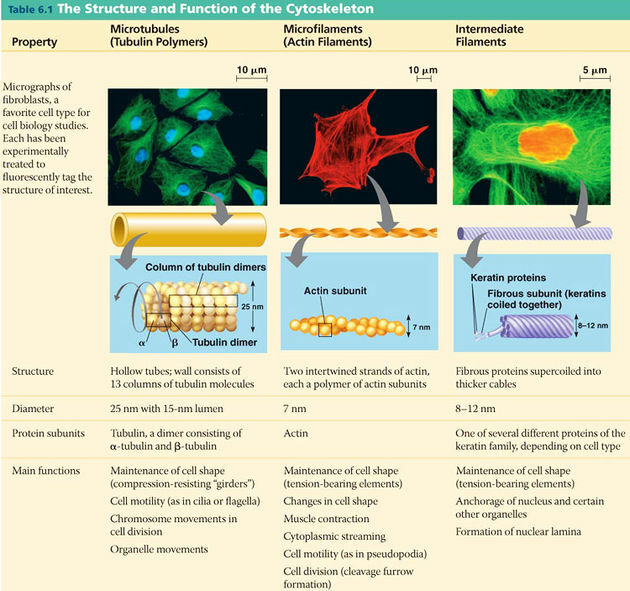 In summary, the cytoskeleton is made up of proteinous fibers of increasing size microfilaments, intermediate filaments, and microtubules. Microtubules are helices made up of actin subunits, the intermediate filament is made up of different subunits that form a fibrous coiled structure, and microtubules form a tube structure made up of alpha and beta tubulin. Microfilaments and microtubules are dynamic, they are constantly being built and broken down. Intermediate filaments are more permanent. MLA (Modern Language Association) "The Eukaryotic Cell Cytoskeleton." ScienceAid, scienceaid.net/the_Eukaryotic_Cell_Cytoskeleton Accessed 23 Apr 2019. Chicago / Turabian ScienceAid.net. "The Eukaryotic Cell Cytoskeleton." Accessed Apr 23, 2019. https://scienceaid.net/the_Eukaryotic_Cell_Cytoskeleton. Thanks to all authors for creating a page that has been read 2,646 times.